PROVERBS 27:1 KJV "Boast not thyself of to morrow; for thou knowest not what a day may bring forth." 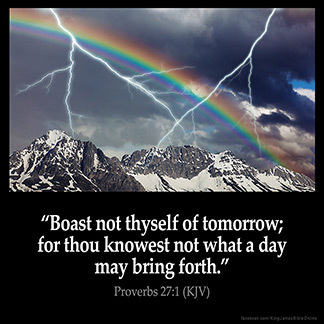 1Boast not thyself of to morrow; for thou knowest not what a day may bring forth. 2Let another man praise thee, and not thine own mouth; a stranger, and not thine own lips. 3A stone is heavy, and the sand weighty; but a fool's wrath is heavier than them both. 4Wrath is cruel, and anger is outrageous; but who is able to stand before envy? Boast not thy selfe of to morrow: for thou knowest not what a day may bring foorth. 27:1 Boast not - Of any good thing which thou purposeth to do, or hopest to receive tomorrow, or hereafter. Knowest not - What may happen in the space of one day. The day is said to bring forth, what God by his almighty power either causes or suffers to be brought forth or done in it.